Fairmont Hotels & Resorts teamed up with Lexus this summer to offer a package called the Lexus Hybrid Living Suites at two of its hotels. Guests staying in this suite will get the keys to a Lexus LS 600h L during their stay. It's an interesting partnership that could benefit both companies. Fairmont Washington, D.C., GM George Terpilowski definitely sees the deal's upside. Q. Where did this Lexus Hybrid Suite idea come from? A. Lexus approached Fairmont because both companies have a proven track record of leadership in terms of environmental stewardship. We share a commitment to a sustainable lifestyle and responsible operations but also to providing luxury experiences for our guests and customers. For both companies, this partnership allows us to offer new, stylish experiences that are unique tour our brands. Q. Have you had a partnership like this before? A.We have not had such a comprehensive partnership that reaches so many guest touch points - from in-room and in-hotel guest stays, to direct marketing vehicles as well as events where attendees experience the brands, the partnership yields rich opportunities to showcase the brands to a wide audience. Q. How exactly is the deal with Lexus set up? A. The partnership evolved quite naturally. We both saw an opportunity to leverage programs that we were working on independently that were an excellent fit. Lexus' Hybrid Living initiative, a series of events and a web portal that showcases luxury products made with sustainability top-of-mind, is helping to define and inspire a new eco-luxury lifestyle by featuring furniture, fashion, art, food, architectural structures and other products that are kinder to the environment. The Lexus Hybrid Living program brings together like-minded individuals and companies, such as Fairmont. Also, we were working on our own "signature suites," a collection of themed suites that provide a guest experience that goes beyond the room. 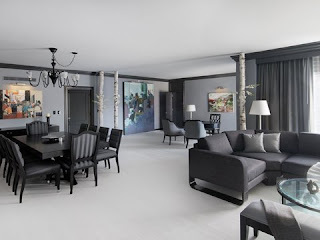 These specialty suites are designed to reflect the destination through their décor, amenities and often activities in conjunction with local partners. Fairmont was interested in partnering with a US luxury automotive partner. Fairmont has had a lot of success increasing brand awareness and loyalty by offering its guests access to exclusive offers and enhanced service offerings through its partnerships such as Saks Fifth Avenue and EMI Music. Lexus undoubtedly had a lot to offer Fairmont guests - who also share its commitment to living well with a conscience. Q. Are there any rules for guests that drive the car? What are they? A. Yes, they are clearly stated in the waiver forms provided to each guest. Q. How is the insurance handled? A. Fairmont and Lexus have worked this out as part of the overall corporate partnership, which also involves 16 Transportation cars. Q. Does it cost you extra, is it something the driver signs off on, is it something Lexus deals with? A. No. This is part of the Lexus/Fairmont corporate partnership agreement. Q. Was there any concern about these safety issues before implementing this amenity? A. Yes. However, Lexus has had years of experience with these programs and has provided an important safety and liability framework for Fairmont. Q. Why is this something guests will want? A. 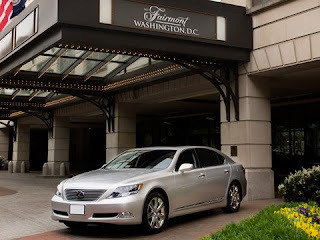 The typical guest who would be interested in the Lexus Hybrid Living Suite at The Fairmont Washington, D.C., is one who knows that you do not have to forgo style and comfort while making eco-friendly choices. They would also share a commitment to environmental stewardship. Q. What is the gas situation? If the guests drive it a lot, are they to inform you that they need to fill up, or is it up to the guest? A. This is our responsibility. We check the car daily, and make sure it has gas. Q. When does this service end? A. The Lexus Hybrid Living Suite will be part of The Fairmont Washington, D.C. indefinitely. All packages are good through the end of the year, and then they are reviewed for revisions and updates for the following year.